The Friends system in Tanki Online lets you keep your friends even closer than before! In the upper bar you can see the Friends button. 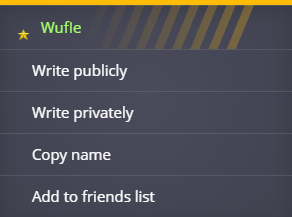 Clicking on it will open up a menu that stores the nicknames of all your friends. 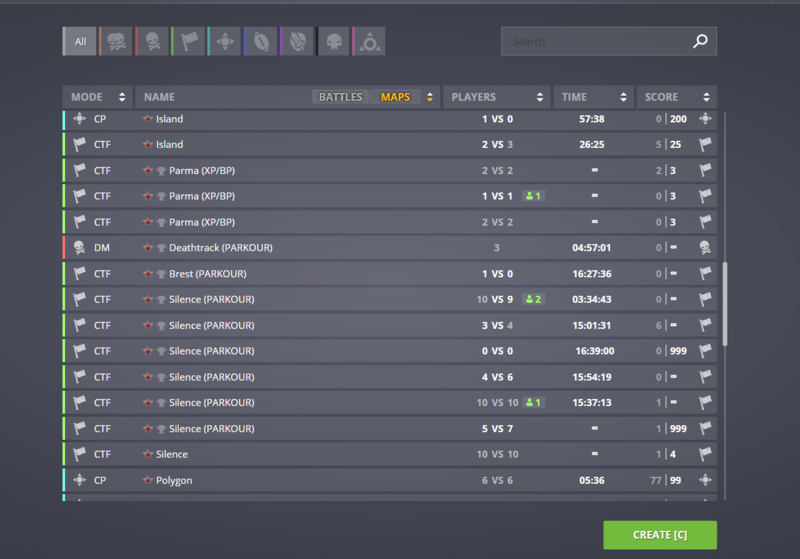 If a player has already been added to your Friends List, his/her nickname will be highlighted in the battle statistics table, battle info and in the chat. You can also look through all "incoming" requests. The Friends system supports a search function that allows you to send requests even to players that you don't see in battles or in chat. Only a person that has confirmed your request will be added to your list. This tab is used for displaying all incoming requests sent to you by other players. You can accept a request or deny it. You can also use the search function to find a specific player from the list. Once you add a friend, an exclamation mark will appear by the Friends button. Once you click on it, your friend will appear at the top of your list and the system will register that you have seen the name of your new friend. The next time you open your Friend list, he will then be placed alphabetically with other friends. Attention! There is a limit of 50 incoming requests you can have at any time. If this number is exceeded, all of your incoming requests will be removed. The above means that if you already have 50 requests in your inbox, and a player tries to send you a new friend request they will get an error saying your friend requests are full right now. At the same time, the list of all friend requests sent will be removed, to improve performance. Attention! You can have 300 friends in your list at the maximum. If someone tries to send you a request, they will get an error saying that your friends list has reached the maximum capacity. To add more friends once you reach this limit, you will have to remove some existing friends from your list. Experienced players can use the "Ctrl + left click" combination to send a message to a specific player without using the context menu. When you receive a new incoming request or another player accepts yours, an indicator appears on the "Friends" button. Make sure you don’t miss these notifications. If your friend is in a battle or in the game, you will see a link to the battle or the server in your Friends menu. At present, your friend's nickname will not be highlighted over the top of his or her tank in the battle itself. You need a confirmation to delete someone from your friends list. If you decide to remove a friend, you will also be automatically removed from his or her list. Keep that in mind. Update 196 added a new feature to the friends system. Now players can now invite their friends to battles. If someone invites you to a battle, you will get a notification in the top right corner of the screen. If you don't want to receive invites from your friends, you can always disable notifications in Settings. Playing with friends in Matchmaking battles is only possible using the Groups feature. 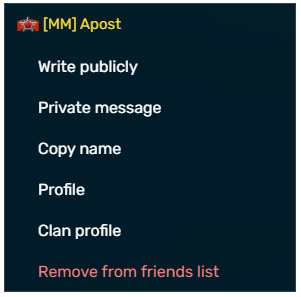 If you enabled this option in your Settings, only users inside your Friends' list will be able to send you Private Messages. If disabled, all users will be able to send you a message. This page was last modified on 24 August 2018, at 22:41. This page has been accessed 79,280 times.